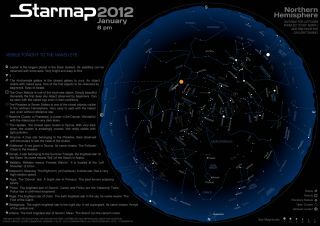 Starmap is providing users with customizable regional star maps to help engage both amateur and experienced skywatchers. Skywatching enthusiasts, rejoice! The makers of a popular astronomy app have released a series of free star maps and new educational tools to help both casual and more experienced stargazers learn more about the cosmos, the app's designers said. Starmap is providing users with free customizable regional star maps and an infographic that illustrates the history of astronomy, and includes resources can be downloaded from the company's website. The resources join the ranks of a growing field of space-themed apps for digital devices. "You can download the map month-by-month for the Northern and Southern hemisphere, and you can see the exact times on a list of what can be seen with the naked eye or with telescopes," Frederick Descamps, an astronomer and the creator of the Starmap mobile app, told SPACE.com. Once users select their hemisphere, region and desired time of night, the map is automatically generated and highlights constellations, planets, moon phases and other cosmic objects that could be visible. The maps will also separate objects that can be seen with the naked eye, binoculars, small telescopes and larger telescopes. "Most Starmap users are not astronomers," he said. "To my surprise, some people were using Starmap who had never looked at the stars before, but they were interested in practicing everyday astronomy. Before, I think some users were able to locate some planets and some main constellations, but something was missing and people wanted more." Descamps said both amateur and more experienced skywatchers should find the new star maps engaging, and they are particularly useful as a supplement to those who have already purchased Starmap on their mobile devices. "It's about simplicity," Descamps said. "The fact that it's easy to carry and have with you, I think that has opened astronomy up to a lot of people. With the maps and the infographic, we want to reach a lot of people, especially people who have not asked themselves questions about stars and astronomy before." This infographic, created by the makers of the mobile astronomy app Starmap, illustrates the history of astronomy. "It's a reference, and it's a really scientific map," Descamps said. "There are a lot of free and a lot of bad applications, but with Starmap, you're buying a tool. I know some people use it to orient their telescopes and prepare their observations. You can enter what kind of optical device you have and it shows you on the screen exactly what you should see in the eyepiece. Some people use Starmap on the iPad and then project it onto a screen. It's very versatile." While Starmap continues to be a hot seller, Descamps is already hard at work on new and different apps. One will focus on light pollution, and will not only demonstrate its impact on stargazing, but the financial effect as well. "Living in the south of France, I woke up one night and passed by the window and was very surprised because it was totally dark outside," he said. "There was no lights on at all and it was so surprising what you could see. I thought, look what you're missing. And that's one thing I'm working on right now." The Starmap app is available on Apple's iTunes store for $11.99 and is compatible with the iPhone, iPod touch and iPad.